Unique spiderweb turquoise and Australian opal handmade sterling silver ring by Hileman Silver Jewelry. 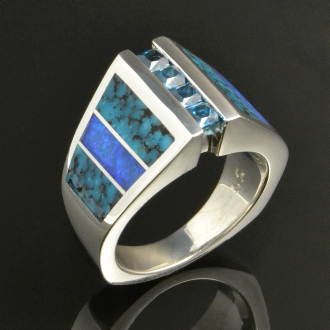 The turquoise and opal inlay in this ring is accented by four channel set princess cut blue topaz totaling .72 carats. The blue topaz and blue spiderweb turquoise look great with the blue fire in the opal. The ring is 14mm wide at the top and tapers down to 4mm at the bottom. The inside of the ring is stamped "SS" for sterling silver and is handsigned with the initials "MMH" for Mark McBride Hileman. The ring in the photo is shown in a size 7 scale. The sample ring in the photo has sold. Please allow 3 to 6 weeks to complete your made to order ring. Select your ring size from the drop down size menu. Please read our policies prior to ordering.